The privet (Ligustrum spp.) 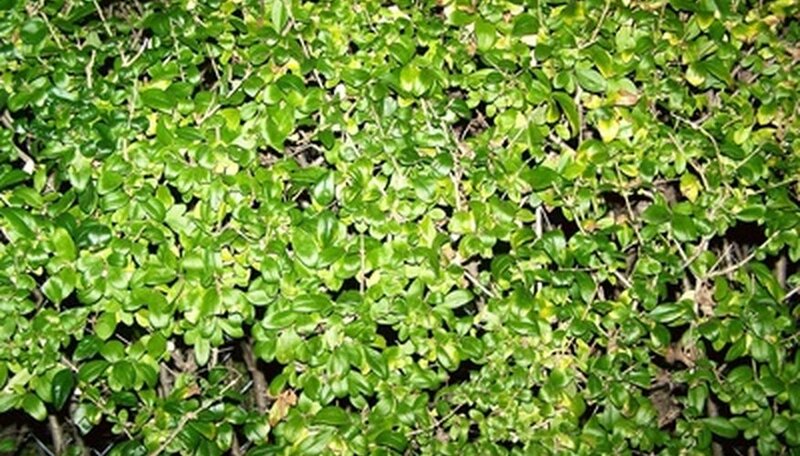 is a popular shrub used in hedges to separate a landscape into sections or to provide a privacy screen. Homeowners prize privet hedges for their rapid growth, dense growth formations and hardy nature. Knowing what to expect when growing a privet shrub, and how to best maintain it, can help ensure a successful hedge-growing experience. Gardeners should monitor their privet shrubs carefully to avoid invasive movement via underground runners or prolific seed production. Though most varieties are non-invasive, the University of Florida warns against letting the glossy privet (Ligustrum lucidum) and Chinese privet (Ligustrum sinense) grow out of control, since these commonly escape their domestic boundaries to invade surrounding woodlands or fields. Manual control through digging or mulching and chemical controls like herbicide can help keep invasive privets in check. How close the gardener arranges privet shrubs will determine their final look. For low, compact hedges, privets should be planted approximately 2 feet apart. Shrubs spaced approximately 4 feet apart will form looser, taller hedges. Homeowners can choose from many privet varieties. Subtler varieties like the Japanese privet (Ligustrum japonicum) are ideal for hedges. Homeowners should be wary of using fancier privet varieties, like the glossy privet (Ligustrum lucidum) or the variegated Chinese privet (Ligustrum sinense 'Variegata'), for hedges; their appearance can be distracting in large quantities. On the other hand, variegated privets are often grown as stand-alone specimen shrubs in containers or as centerpieces in a landscape, according to the University of Florida. Gardeners must use pruning equipment like mechanical hedge trimmers or pruning shears to maintain the privet shrub's appearance, especially if grown as a formed hedge. Privets are one of the fastest growing hedge shrubs and require multiple pruning sessions throughout the spring and summer growing season, according to Purdue University. Trim the shrub when its new green growth has reached a length of approximately 6 inches. Hedges need rejuvenation if they're severely overgrown. To rejuvenate privet hedges, cut them down to 12 inches from the ground. Purdue University recommends this technique for privets, though its not recommended for most other types of hedges. Trim the hedge as usual once it begins growing back.